A South Australian power price shock in July and a state-wide blackout in September provided fertile ground for those who live by the motto: never waste a good crisis. It would be a very poor outcome if in the aftermath of these events we lost focus on the biggest challenge facing the energy system in the pursuit of short-term political gains. There are illegitimate and legitimate roles that can be attributed to wind generation in the recent South Australian drama. The power of the wind certainly wreaked havoc on the state’s transmission towers as evidenced by graphic footage of bent and broken transmission towers. Yet all the evidence available indicates that wind power generation did not contribute to either the initial system failures or the subsequent state-wide blackout. Wind generation was on line prior to Wednesday’s storm and was part of the mix as the system returned. At 7.30pm on 7 July, the state’s wind generators were virtually idle. The last coal plant had shut in May, the sun was down and there were constraints on backup due to the unavailability of the interconnector with Victoria. Gas generation set the electricity price and it was high. The market delivered, the lights stayed on and prices had reduced close to prior months’ levels by August. 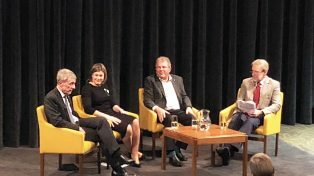 Yet, this event did expose potential threats to the price and reliability of power that need to be considered and have been raised by Josh Frydenberg, the federal Minister for the Environment and Energy. To put all this in perspective requires a return to the underlying issue: the need to address climate change. Australia has committed to reduce greenhouse gas emissions by 26%-28% below 2005 levels by 2030. It is the absence of a credible, national climate change policy to reduce power sector emissions in line with this target that creates unmanageable investor uncertainty and drives state and territory governments to adopt their own policies, misguided as they might be. The policy priority for the commonwealth government is to use its planned 2017 review to build on its Direct Action policy to deliver a credible and predictable plan that can meet the existing target and can be scaled up to meet future, more stringent, targets that almost certainly will emerge. The Climate Change Authority and a recent Grattan Institute report, Climate Phoenix: a sustainable Australian climate policy, showed that this could be done. With such a policy in place, attention can turn to two key issues. The first is to review the national electricity market to see if and how it might need to be complemented with commercial or regulatory changes to respond to the specific challenges of integrating high levels of intermittent generation sources such as wind and solar power. There will be solutions, but a conscious focus is needed to ensure they can and do emerge. This is also where the prime minister’s concern about renewable energy and system security should be addressed. The second issue is the role of renewable energy targets adopted by federal, state or territory governments. In 2001, the Howard government introduced a national mandatory renewable energy target (RET). Through a period of Labor governments and re-elected Coalition governments, the target has been expanded and contracted, almost to exhaustion. A key outcome has been the deployment of wind power in South Australia to the extent that 40% of that state’s electricity now comes from wind. This was due to favourable wind conditions, proximity to transmission lines and effective approval processes. The South Australian government does have a target of 50% renewable energy by 2025, subject to national renewable energy policy being retained. So far, this target has taken a back seat to the national target. Last Sunday, a Grattan Institute report, Keeping the lights on: lessons from South Australia’s power shock, concluded that policies such as the RET had been introduced with inadequate consideration of the consequences for the electricity market. This concern relates as much to the federal target as it does to state or territory renewable energy policies. The report raised specific concerns in regard to a proliferation of uncoordinated state and territory policies that could lead to perverse outcomes when designed without consideration of national policies or market impacts. These could include subsidising specific technologies in specific states when a lower cost outcome with the same environment outcome could be achieved through a national, coordinated approach. Primary responsibility for sorting out this mess sits with the federal government. The right national climate change policy would negate any justification for renewable energy targets at any level. It should get on with the job.